The Bauer Junior II is the compact highly mobile diving compressor of the Bauer range. Its rugged build makes the Junior II the obvious choice for the recreational and professional diver alike. The new JUNIOR II is a product backed up by more than 50 years of experience and strict BAUER Quality Management according to DIN EN ISO 9001. The heart of the Junior II is the durable, long-life 3 stage compressor block. Drive is via a Honda petrol engine, single phase 240 volt electric or 415 volt three phase electric motors. The choice is yours. 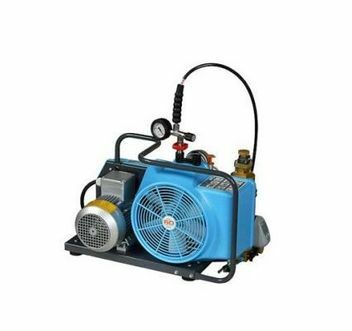 The Junior II is suppled as standard with a 1 metre filling hose and depending upon the model specified, a 200 or 300 Bar filling control valve and pressure gauge. Also available is a switchable 225/330 bar model supplied with 2 filling outlets being 225 Bar and 330 Bar respectively (available at extra cost). Question about "Bauer Junior II Compressor"